November was National Family Caregivers Month. In his Presidential Proclamation in celebration of caregivers, President Obama reminds us that our great nation was founded on the ideal that we all do better when we look out for one another. For millions of Americans, this concept is more than an ideal. It’s a day-to-day reality. According to the Census Bureau, there are nearly 57 million people living with disabilities in the United States. Thirty percent of American adults are involved in providing care for a sick or disabled family member. Caregivers provide physical and emotional support for the people in their care. It’s a demanding job with its stresses and rewards, but it’s also a labor of love. At Social Security, we understand this duty. Our agency is committed to you throughout life’s journey, helping secure today and tomorrow for every American. 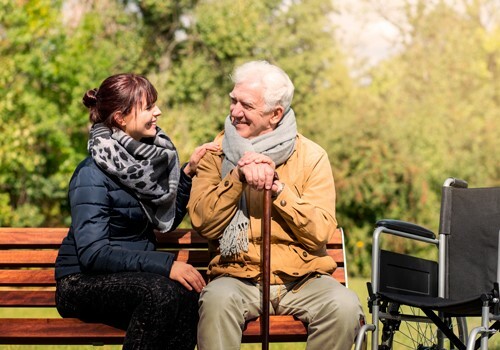 Caregiving is near and dear to our hearts, and it is deeply ingrained into our employees and who we are as a federal agency. Our agency works closely with caregivers through our Representative Payee Program. A representative payee is someone who receives and oversees the Social Security or Supplemental Security Income benefits for anyone who cannot manage his or her benefits. This can be a child or an adult incapable of managing their own funds. A representative payee is usually a trusted family member or friend of the beneficiary, but when friends or family are not able to serve as representative payees, Social Security looks for qualified individuals or organizations to represent the beneficiary. You can learn about becoming a representative payee by watching our new series of training videos on the duties of a representative payee. It is our hope that these training videos will not only educate individuals about the roles and responsibilities of being a representative payee, but also provide further insight, broaden community awareness, and provide key resources related to the growing incidents of elder abuse, neglect and financial exploitation. Caregivers are valuable and irreplaceable assets to our great nation. Please join us in celebrating them for all they do for those we need them most. This entry was posted in Health Care and tagged caregivers, Disability, disability benefits, disability insurance, disabled, disabled child, National Caregivers Month, rep payee, representative payee, social security disability, social security disability benefits by Stacy Rodgers, Chief of Staff, Social Security Administration. Bookmark the permalink. Then why does Medicaid reject applications for coverage in assisted living or memory care facilities for people who have live-in children as caregivers? Great question. I’d like to know too. Please contact your local Medicaid office for questions related to your medical assistance benefits. Medicaid has nothing to do with Medicare or other Social Security Programs. Call the County Aid Office (Welfare) if you want an answer to that question. I’m not sure what state you live in but if you are looking for extra help you can contact Department of Human Services. Unfortunately there are income requirements, I was kicked off Medicaid then put on a program that I had to pay out of pocket so much money and then I would be put back on Medicaid. I’m now back on Medicaid. If you ca not locate your local DHS office you could try contacting Social Security and she if they may have the contact information. It’s worth a shot. Worst that. An happen is another NO! I feel your frustration. Before Mr. Obama leaves office, it would be great if he promoted improved tax benefits for caregivers allowing deduction for home and facility care such as Long Term Care for which family members either provide the services at no charge, or pay others to provide care until and unless the disabled person qualifies for Medicaid. Care of the disabled bleeds all the assets not only of the disabled person but family members forcing people to resort to Medicaid as the only option. A decent tax deduction for caregivers would delay and in many cases prevent both the disabled person and his or her caregivers from losing all their assets forcing them all onto Medicaid. I couldn’t agree with you more….. I agree. My mom’s caregiver left his job to provide full time care. Care was expected to be for 6 months, but thankfully, we are at over 2 years now. No income for him due to the 24 X7 care. He is paying outrageous premiums for health insurance. Tax help would be a great start. Suggest it to your Congressman unless you feel this is another area in which the President can issue an EO. I have had no income for six years. My Social Security benefits will be next to nothing years from now when I can begin collecting. If Obama really wants me celebrate caregivers, he would do something about this. I cared for my late father at home for over seven years, and I could not afford to pay any Social Security or Medicare taxes to the Federal Government. This period of 24/7 care by me alone in my father’s home was from 1991 to 1998 and I returned to work full-time in 1999. Among her campaign statements, Hillary Clinton had said she would seek to have Social Security increase retirement benefits for people like me, who lost credits because we were full-time caregivers. I am wanting to know if President-elect Trump has similar plans to help us who lost retirement benefits because we cared for a loved one until their death. My dad died at the end of 2000, having been paralyzed from surgery at the age of 72. I retired at the end of 2013 and am today receiving SS retirement and Medicare. Please advise as to any information you have regarding changes that would help us people like me who are in this category. We as a group saved state and federal government lots of money by doing this, but have never have been recognized for our having done this. Thank you. Clinton’s proposals were purely political, to get votes and has no basis in reality. After all didn’t 10’s of millions of women stay home to raise children? No one is suggesting anything be added to their non work years to fluff up the amount received based upon their earnings record so why in your case? I agree with what was said about the payee of the person or family member that has to deal with a disabled child person or whom ever they represent. Why is there no incentive or extra pay for dealing with these people who cannot help themselves. For a family member they could not live on what is actually paid to them. So it befalls to the person who represents them to use what they hardley have to get them through. There needs to be more accessible help for them especially Food Stamps. The ones the government seem to give more Stamps to is the individuals who really don’t need the help, can help themselves or drug addiction people. This makes it harder on the ones who are really disabled since birth. Its like the government penalize them for being born disabled. It seems like they care more for regular people than handicapped or Severely disabled people born at birth. Our priorities seemed to be gone a strayed. Help me with this problem if it seems like a more important subject. Or maybe if the government thinks its worth the effort to help Special Needs People at all. Evelyn…You make excellent points!! Food stamps are doled out to able bodied men and women EVERYDAY with less requirements needed to apply for a JOB!! Some even receive cash stipends for utility payments…just say you are caring for your grandchildren is all it takes! I see NO DIFFERENCE!! WHY aren’t benefits given to able the bodied who chose NOT to work, the grandparents who takeover their grandchildren care given to caregivers of their elderly and disabled family members??? NO ONE in our government can or will give us an intelligent answer! Yep, the taxpayer should have to subsidize all the problems in life we are dealt with. Let’s not let love and duty interfere with taking care of a handicapped child. I really need dentist work. I am a diabetic and have a hard time eating. With being on Medicare, I can not afford anything. If anyone can help me, please. Wendy…Depending where you live large cities (you may have to travel) have dental clinics for low income patients. They charge according to income. Another resource is dental schools/colleges. Please call your local Department of Aging or Senior Citizen Resources Center . They will be listed in the Whitepages phone book or you can Google them!! Good Luck!! Medicare may pay for dental services in specific cases. For more information on what Medicare covers, and to learn about programs that may help you save money on medical and drug costs visit http://www.Medicare.gov. We hope this information helps. I am so depressed this afternoon.I just wanted to go to sleep and Not wake up.Today i called Social Security 800# and Inquired what the meaning of the decision of the Law Judge on my ssa account meant and Marilyn from Social Security actually read my Letter of UNFAVORABLE decision and she said its dated 12/27/2016 in which today is the 21st. she asked me why i am upset crying. i said you just read me my denied letter i filed appeal 1/8/2015 yes almost 2 years ago and she tells me on the phone 4days before Christmas and i only called to ask a questions of a meaning and she sure answered that with reading my letter. Mind you i have Medical Evidence of my body and there are really no jobs for me.nor would anyone even hire me i would be a high risk employee to them even the VE stated. i so am ready to call the President of the United States to help me.this is wrong.There are people out there abuse the system and a true honest person gets screwed. gets kicked to the curb.Might as well of spit in my face. thanks for the Christmas Ruined present Social Security.I hope you Marilyn have a great Christmas since you ruined mine and my life. I have not received my statement on my social security income for 2017. Everyone that I know have received their statements. Can you check and see why I have t received it? Thank you. Hi! Thanks for your question. The cost-of-living adjustment (COLA) notices for 2017 are mailed out to beneficiaries during the month of December, so please continue to look out for it in the mail. Remember, if you need proof you get Social Security benefits, Supplemental Security (SSI) Income or Medicare, you can request a benefit verification letter online by using your my Social Security account. To sign in or create an account, click here. I am wondering if there are benefits available for my care taker? If so, how do we apply? I can’t function without him? Thanks for your question, Dione. We do not pay caregivers. However, you may be eligible to receive social services from the state in which you live. These services include free meals, housekeeping help, transportation, or help with other problems. To get information about services in your area and find out if you qualify, you will need to contact your state or local social services office. Or you can visit the U. S. Department of Health and Human Services (HHS) web page for more information. We hope this information helps! i am actually just looking for information…i am limited to working from home because i cannot leave my mom unattended for a full work day. she will be turning 80 years old in a week and trying to maintain bills, pay for medication costs and just surviving is really difficult. I have been told by many that there is some sort of assistance i can receive to continue to take care of my mom at home. I will not even consider putting her in a home because my dad died in 2010 in a veteran care facility where he was not taken care of properly and actually died with such severe bed sores that his spine was exposed at his death. i don’t get help from my siblings in the day to day care and honestly don’t trust them enough to help…i work from home currently as a contractor and therefore don’t receive health benefits and actually cannot afford to take care of my own health. i have high blood pressure and a lot of other medical issues that i self-diagnosis..i go to the doctor when i can….I have worked all of my life and was never without medical benefits until the past 10 years. I have a mold issue in my basement and cannot afford the cost to remediate, allstate my insurance company denied my claim and the commissioner’s office was no help. i’m just looking for support, not a handout. any suggestions or leads would be helpful. my mom has insurance and medicare coverage but during the oct-december time period we can almost barely eat. we are okay today but tomorrow it could be something else, sometimes i have to cut off a call while working because my mom leaves the stove on sometimes or i’m just nervous, my job does not pay overtime and i just recently was notified that my pay of 4.75 per half hour was reduced to $1 per call, i work for carnival, some of our guests can keep me on the phone for 30 minutes or more, i was devastated with my holiday income, we did not celebrate, i don’t even know why i did this search because i am a prideful person…but any guidance would be appreciated. Do caregivers receive monetary compensation from Social Security or some other government organization? Hello Paula. Social Security does not provide compensation to caregivers. Please visit Benefits.gov. This site features an in-depth Benefit Finder tool that serves as a single access point for information on federal, state and local programs from across 17 different federal agencies. Thanks! I am helping take care of my father who is on hospice. Mother is unable to be his only caregiver. Is there a way to get me paid to take care of my father? Hi, Brenda. We are sorry to hear about your father’s condition. We do not pay caregivers. However, you may be eligible to receive social services from the state in which you live. These services include free meals, housekeeping help, transportation, or help with other problems. To get information about services in your area and find out if you qualify, you will need to contact your state or local social services or welfare office. We hope this helps.